This year has most definitely been a year full of weddings for me - five in all - with three of them being those of my closest friends. First there was Rach - my Kindred Spirit...and the one who can make me smile at the very thought of her. :) Hers was the stuff of fairy tales - the celebration of a truly great man at last marrying the girl he had fallen in love with as a thirteen year old boy. Oh, and did I mention it was a double wedding with the bride's fabulous sister and her Prince Charming? Such a fun day...and such an honor to not only stand up in support of my beloved friend in Malibu Blue but also make the 'cutting' cake for the bride and her groom. September brought the wedding of Lolo - my greatest encourager...and the one I can always count on for amazing hugs and late night giggle parties. :) Hers was the perfect Southern affair - Hotlanta style. With a bridal party that included our group of close friends - looking mighty fine in Italian Plum, if I must say so myself - and a reception full of fabulous dance moves, it was pretty much the perfect wedding weekend. And alas, most recently, there was the wedding of Cater - my rock...and the one who's listening ear, wise counsel, and patient heart mean the world to me. Hers showcased the beauty of Virginia Autumn like none other. Held at a quiet, rural vineyard and embraced by the last fall-tinted mountain trees of the year, the evening was the very definition of understated sophistication. Opting to forgo a wedding cake for a bonfire and s'mores bar, the lovely bride had, like most any reasonable person, planned on purchasing some good ol' dependable store-bought ingredients for the sweet treats. Ah but I, of course, would have none of it. Without having ever made either of them before, I insisted upon contributing enough homemade graham crackers and marshmallows to feed 100 hungry s'mores makers. Oy vey...no pressure there! First up, graham crackers. Talking about the project at work, my coworkers repeatedly asked me if it was worth the effort...are homemade graham crackers really any better than the ones in that dependable blue box at the store? The conclusion? Absolutely. Especially considering the fact that I had to go a step further and...wait for it...monogram them. 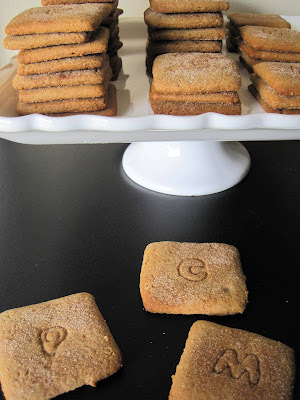 Seriously, how can you say no to homemade monogrammed graham crackers?! Note: While I very often measure my baking ingredients by volume, I took the time to weigh everything but the baking soda and salt for this recipe. Combine the flours, brown sugar, baking soda, and salt in the bowl of a food processor fitted with a steel blade. Pulse on low speed to incorporate. Add the butter and pulse in 1-second bursts until the mixture is the consistency of a coarse meal. In a small bowl, whisk together the honey, milk, and vanilla. Add to the flour mixture and pulse in 1-second bursts until the dough has come together. It will be very soft and sticky. Transfer the dough to a large piece of plastic wrap that has been lightly dusted with flour. Form into a disk, wrap, and chill until firm, at least 2 hours. Meanwhile, prepare the topping by combining the sugar and cinnamon in a small bowl, stirring until blended. Set aside. Meanwhile, preheat the oven to 350°. If desired, use the blunt end of a wooden skewer to create a dotted pattern on the top of each cracker or use a small cookie/fondant cutter to lightly press a unique design. Lightly and evenly top with a dash of the topping mixture. Bake for 12-18 minutes until firm and slightly firm to the touch. Allow the crackers to cool on the baking sheet for 2 minutes then transfer to a cooling rack until completely cooled. Store in an airtight container. I have received raving reviews from the guests- they loved 'em! Thanks again Ash! Ethereal theme. Theme images by Juxtagirl. Powered by Blogger.